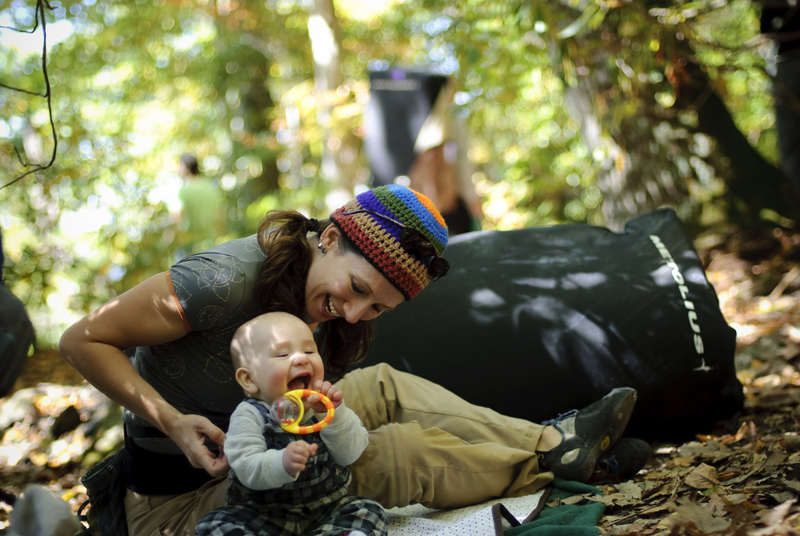 Having a baby on board doesn't have to cramp your bouldering style! 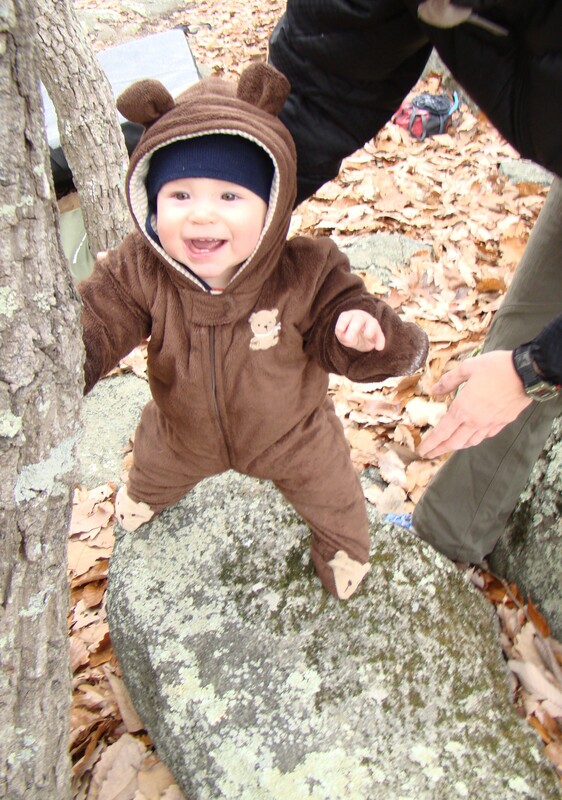 In Rules for the Ropes, I gave some practical tips for how to keep your little cragbaby safe and happy while Mommy and Daddy rope up. But for those of you that prefer a crashpad and a spotter to some quickdraws and a grigri, this post is for you! 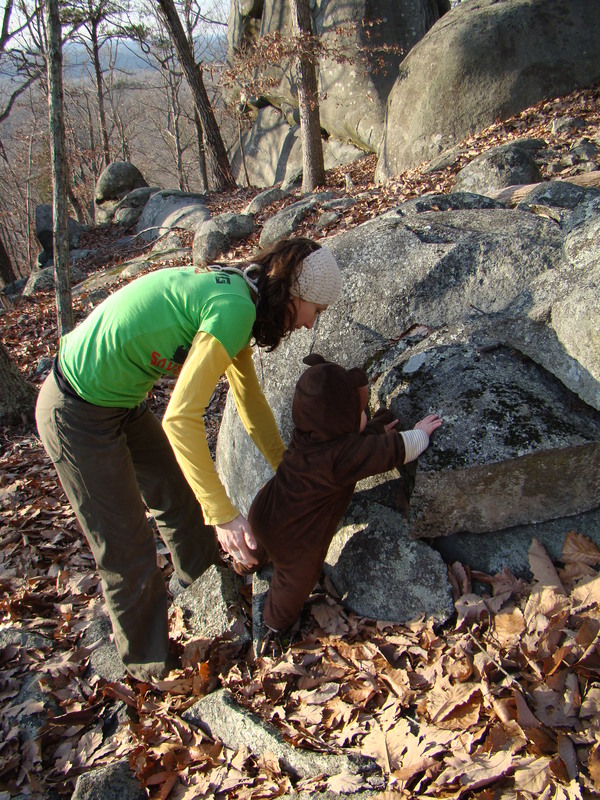 Taking a baby to the boulderfield is much the same as taking him or her to the cliff in many ways, but there are some distinct differences – some pros, and some cons. 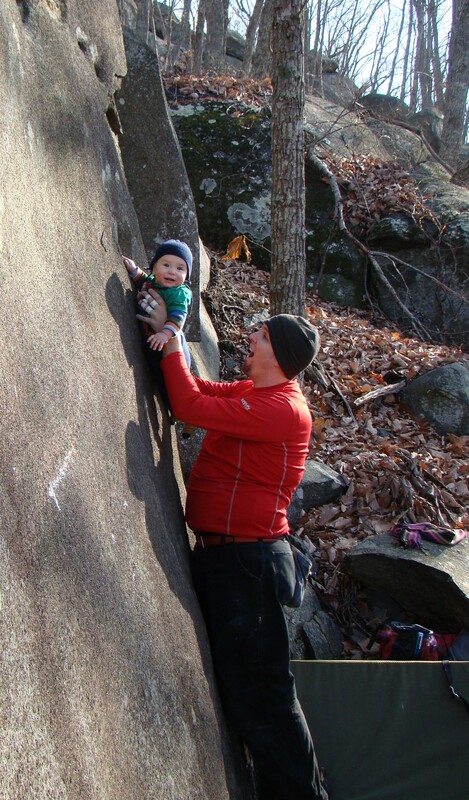 This post will discuss how bouldering compares with roped climbing when it comes to having a little one along for the ride. Less commitment. 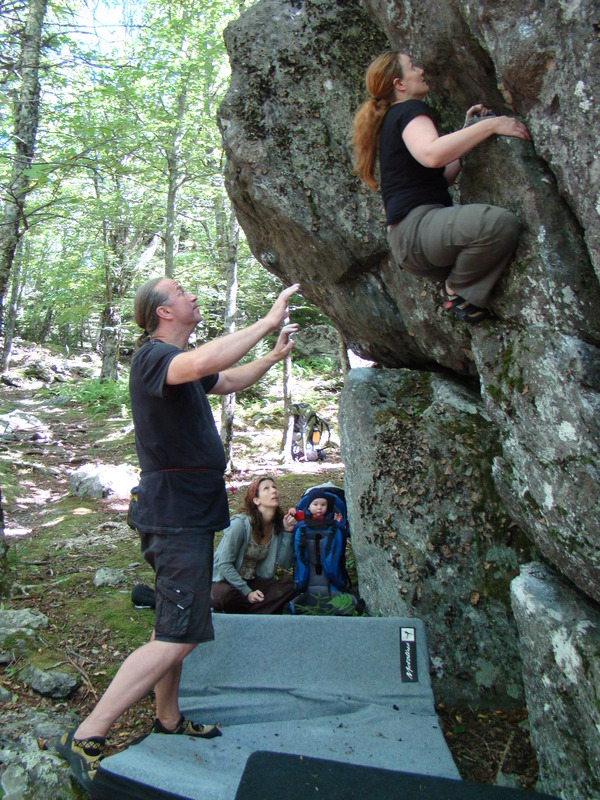 When you’re bouldering, no one in your party is ever more than 15-20 feet off the ground. If baby gets upset while Mom is working her project, its pretty easy for Mom to just stop what she’s doing and waltz on over – as opposed to if she’s on a rope 80 feet up. You can get away with a little less planning of naps/feedings/etc and play things by ear a little more. It’s still necessary to have at least one other person around, unless you’re working really easy stuff that you feel comfortable doing without a spotter, but unlike with roped climbing, adding a whole lot of people doesn’t really slow you down that much, and does provide you with a lot of extra hands. On the move. Boulder problems are obviously much shorter than roped routes, which can mean that you don’t spend as much time in one spot as you might when roping up, especially if there aren’t a lot of folks in your posse. This has the potential to make naps a nightmare – by the time you get your little one down, its time to pack up and head somewhere else! An easy solution is to choose areas with a high concentration of problems in the grades you’re looking for within close proximity of each other. That way you can hang out more or less in the same spot for 1-2 hours at a time, enabling your cragbaby to catch some much needed shuteye. If the boulders are too far away from the baby station for comfort, simply rotate who is climbing and who is hanging out with sleeping beauty. A crash pad doubles as a great nap spot! 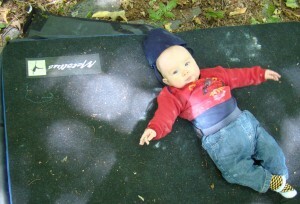 Crash pads are multi-purpose. Its amazing what off-label uses you can come up with for your crash pad! 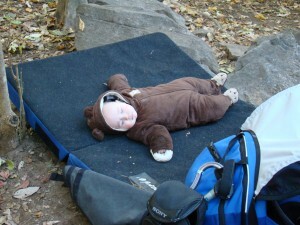 A crash pad is a much softer on-the-go diaper changing station than a blanket on a rock. It can also make a very comfortable napping spot (with snuggle room for the baby watcher too!). The pad works out especially well for sleeping during cold weather, since its such a great insulator when the ground is really cold! Less hazards. 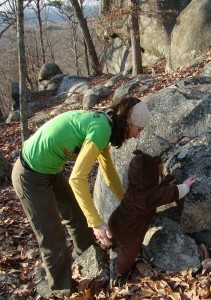 It’s easier to find a safe, out of the way spot for your baby to hang out in when you’re bouldering. While there are still environmental hazards to be on the look out for (bee’s nests, poison ivy, etc.) you don’t have to worry as much about being in a landing zone for dropped gear or loose rock. Holds do still break, but don’t fly as far off of a 15 foot boulder as they would from a 100 foot cliff face. Less room for gear. If you’re climbing routes, both people can carry packs, so you can bring pretty much everything but the crib (and if you’re a beast I suppose you could hike a pack n’ play in…) When Canaan was under 6 months old, I used a Moby or a Bjorn (depending on terrain) on my front, and a large day pack on my back. 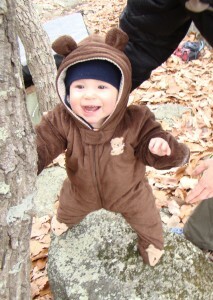 Once he could sit up he moved into the backpack carrier, which had plenty of room for gear in addition to Canaan. But if you’re bouldering, at least one person will have a giant pad on their back in lieu of a cragpack, and depending on the landings at the area you’re climbing in, you may even want two pads. And although folding your gear up into your crash pad is an art to be perfected, it doesn’t hold close to the same amount, is not near as comfortable, and has a higher chance of getting lost along the way. So when you’re bouldering, its imperative that you only pack what you need. "Don't let all the fun fool you..."
So which is easier to start with – roped climbing or bouldering? That depends on you. There are advantages and disadvantages to both. The real answer is whichever you are the most confident about. Our first family crag day was a roped climbing day trip to Pilot Mountain with two dear friends that were sweet enough to volunteer their help in our cragbaby experiment. "....this bouldering stuff is tough business, guys!" It sure seems that you are doing this right because this is one happy and contented little boy! Great Post!